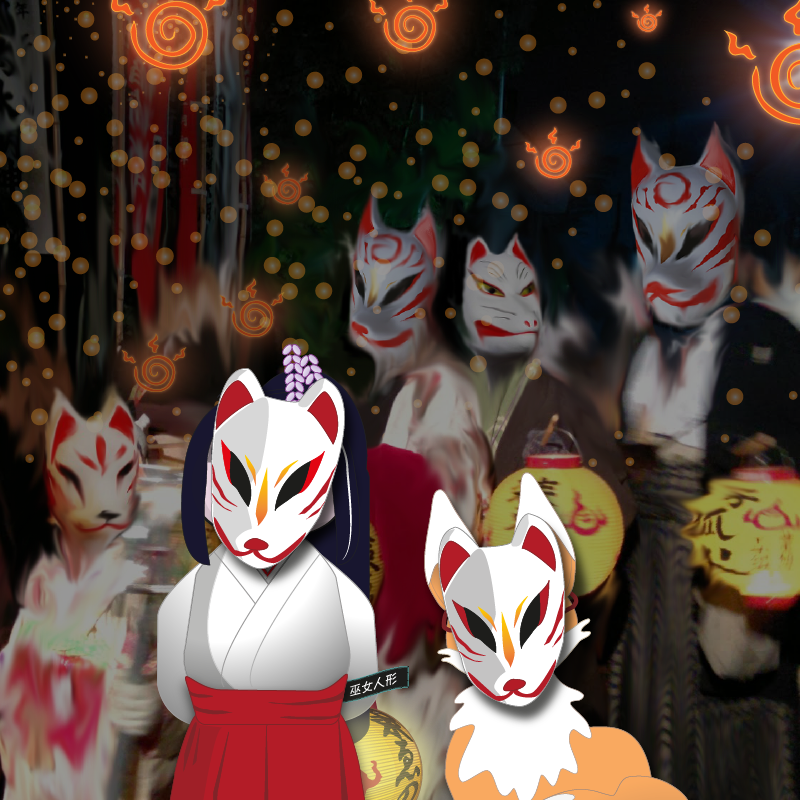 On the eve of the new year of 2015, Kiku and Miko travelled to Oji, in Kita Ward, Tokyo, for the annual kitsune-no-gyoretsu, or Fox Parade. 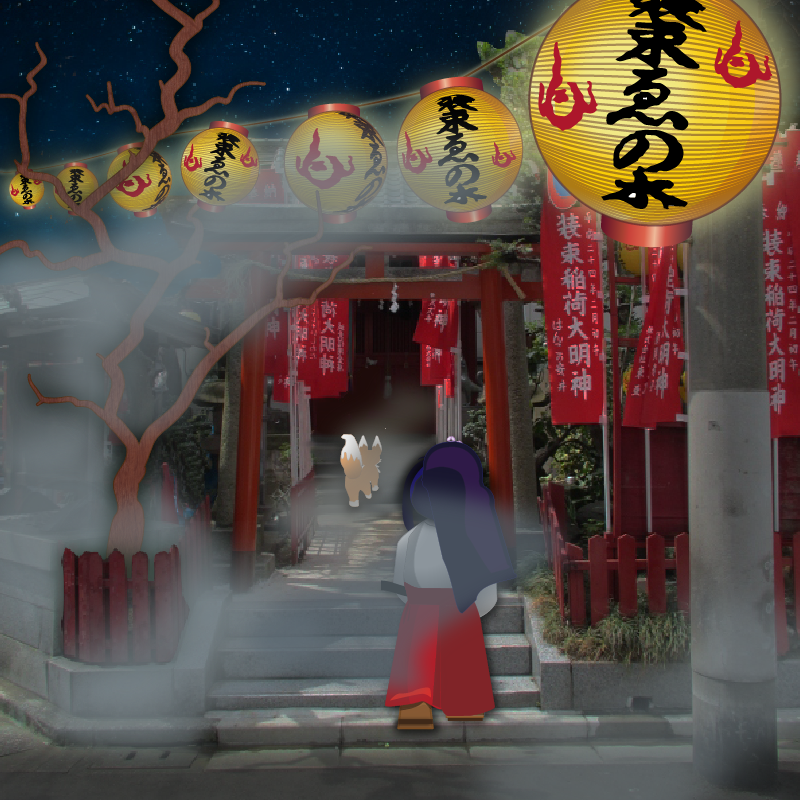 Kiku also wanted to investigate a shrine with links to a Tokyo Tale of fox legend. In England, Kiku’s grandfather used to tell him a tale about the fox guardians of the Kanto region, who would meet annually in Oji on the last day of the year under an old Chinese hackberry tree (commonly known as a nettle or enoki 榎 tree). Here they would change into court clothes, in order to pay a visit to the nearby Oji Inari shrine, dedicated to Inari, the god of the rice harvest, and the head Inari shrine for the Kanto region. Once changed, they could mingle with human worshippers and enter the shrine, to pray and receive orders for the coming year. Rice once grew all around in this area, and farmers who were careful to watch the passing parade to the shrine could predict the success of the coming year’s crops by the number and vibrancy of the foxfire that could be seen. Kiku’s grandfather explained that foxfire or kitsunebi (狐火) is the glow that comes from the hoshi no tama (ほしのたま) or starball, which contains the soul of a fox guardian. Without the star ball, a guardian would wither and die. The enoki tree where the foxes once changed died long ago, but the site is preserved within the small Shozoku (which means ‘changing’) shrine. A young enoki tree now stands at the entrance to the shrine, a continuation of the old legend. In commemoration of the event, a fox parade is still held with a procession moving from the Shozoku shrine to the Oji Inari shrine. 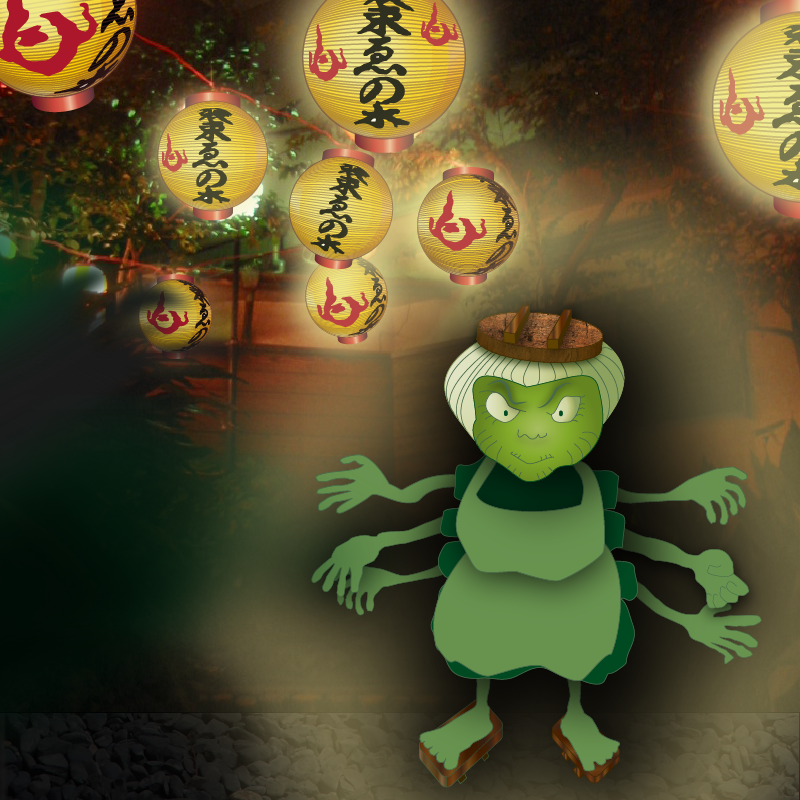 When they reached Shozoku shrine, lanterns had been hung for the parade, and the air was cold and thick with a silvery mist. Kiku walked up the stone path, past the bare young enoki tree now growing at the entrance. “Maybe when this tree is bigger, the foxes will return on New Year’s Eve like they used to?” Miko-chan wondered aloud, but Kiku had vanished around the back of the shrine building. Behind the shrine hall, the air was even colder, and a small thicket of bare trees blocked any further access. As Miko turned the corner, she saw Kiku peering into the darkness, fur standing on end. 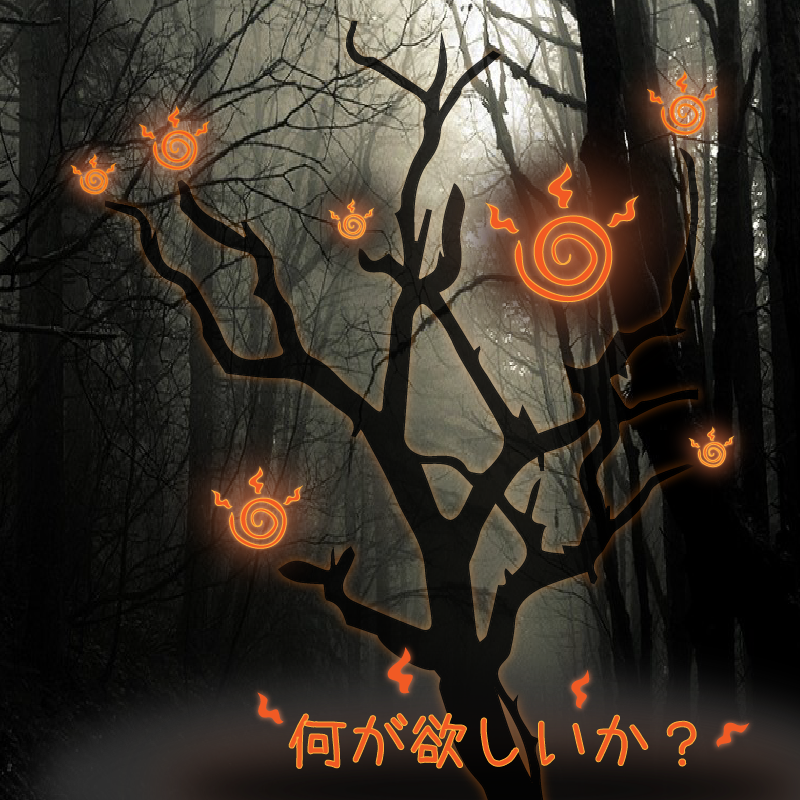 The air had begun to vibrate around them, and the shadow of a large, leafless tree shimmered into view, with a thick trunk and surrounded by a pale orange glow. Spirals of light began to appear at the ends of the branches and a crackling sound, like the burning of kindling, could be heard. “Kitsune-bi!”, Miko whispered, as she held on tightly to Kiku’s tail. “LITTLE FOX, you are not Japanese, and so becoming a shrine guardian would not be an easy path for you to take. Inari is very selective when choosing guardians and only chooses zenko who have strong, pure hearts. You would need to learn about the lives and customs of the creatures around you, paying particular attention to the turn of the seasons. You will also require a star-ball, and this can only be given to you by an existing guardian of Inari. Once you have possession of one of these, you can learn to harness and control your own fox fire and light your way to the future you desire”. The crackling sound had begun to intensify and was starting to block out the words coming from the tree. “As for your other desire, to live as long as a Tenko will take extreme dedication and again an affinity with the passing of the seasons. If you can learn to become attuned to the passing of time then you can learn to stretch your own time in this earthly realm”… The crackling had almost become deafening when it suddenly began to fade, along with the vision of the tree. After the tree had vanished, the air became even thicker with mist, making it hard to breathe, and so the pair turned to leave, worried that they would become completely lost. “How will I ever find a star-ball?” thought Kiku, although he felt encouraged by just the appearance of the tree and the fact that it had spoken to him. He walked down the path and out onto the street, following the enticing smell of street food being prepared for the evening’s parade. As Miko was going down the last few steps at the shrine entrance, her sleeve caught on the young enoki tree. She tried to pull her sleeve free, but realised she was being gripped tightly by her collar. “No…” whimpered Miko, who was now very scared that she would be buried alive. 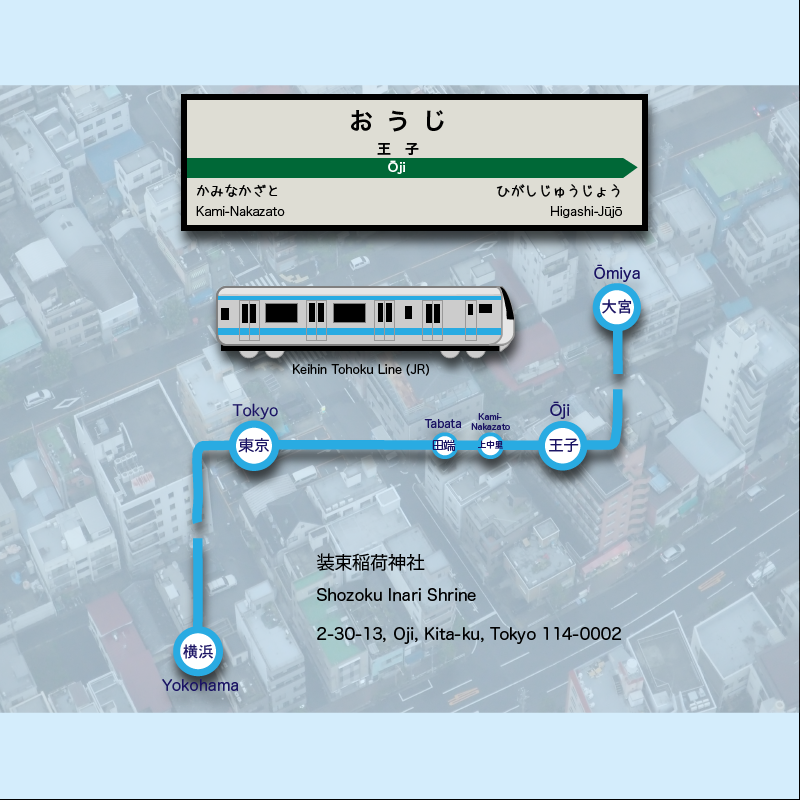 Kiku, who had come looking for his friend, heard the conversation and came around the tree, explaining to Mama Kojin that he had found Miko in a box at the Lost and Found Office of a Tokyo station, and he was helping her to live independently in the city, without owners. “And who are you?” asked Mama Kojin, her six hands all pointing at Kiku. The little fox explained how he had come to Japan to try and become a shrine guardian, and together with Miko, they were trying to find a place for themselves and discover more about Tokyo and its inhabitants. “Thank you, Mama Kojin!” said Miko, as she realised the pair were back at the entrance of the shrine, the enoki tree next to them and the green old woman gone. The pair walked down the steps, under the soft glow of the parade lanterns, strung along the path and out onto the street. What a night! The fox and the doll looked at each other and smiled. “I guess we have a long journey ahead of us,” said Miko-chan, quietly. “Well, let’s begin by joining the parade!” said Kiku, looking over at the street stalls being set up. Figures had begun to gather at the entrance to the shrine as the time for the parade approached, and the sound of children’s laughter could be heard. The mist had completely cleared and the night was clear and filled with stars. “I can’t tell who is human and who is something else…” said Miko laughing, “we should fit right in, if we can each get a mask.” They stopped at a small stall, being run by what looked suspiciously like a grey furry animal, wearing a white fox mask. After choosing their masks, they joined the gathering crowd. 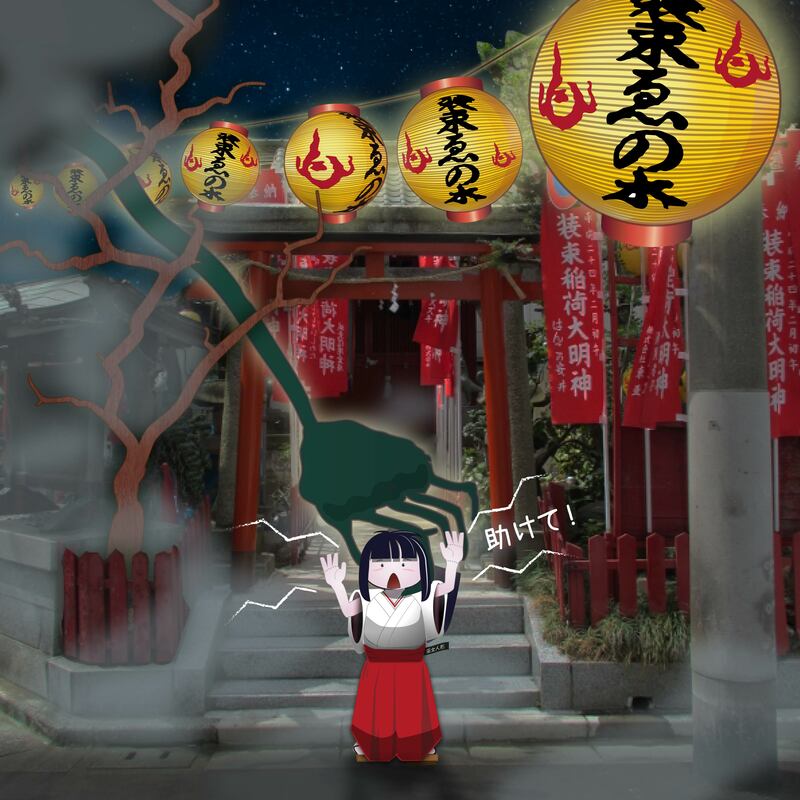 “I think that might have been a tanuki!” whispered Miko, but when Kiku turned back to look, the stall had vanished. They smiled at each other, both covering their faces with the masks, and stretching the elastic around their heads. For the rest of the night, they joined the crowds, following the parade of mysterious masked foxes, from Shozoku shrine through the streets to Oji Inari shrine, ready to welcome in the new year and looking forward to their time ahead in Tokyo, learning about Japanese customs and making new friends. The Shozoku Inari shrine is about a ten minute walk away from the stations. The parade itself has a fixed number of participants, but anyone can watch and follow its progress between the two shrines. Buy a fox mask and see if you can spot any fox tails sticking out from clothing! ‘New Year’s Eve Fox-fires at the Changing Tree, Oji’ is a woodblock print by Ando Hiroshige, c.1857, and shows the meeting of the foxes at the nettle tree.